Wagon Wheels, Cannon Wheels, Steel Wagon Wheels, Yesterdays Products, Handmade In The USA Today. 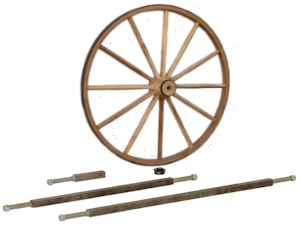 We make Wagon Wheels, Wooden Wagon Wheels, Cannon Wheels, Custom Wagon Wheels, Steel Wagon Wheels,, Decorative Wagon Wheels. Carriage Wheels and Buggy Wheels. Yesterdays Handmade Wagon Wheels, Handmade in the USA Today. For over 50 years Wagon Wheels and Wagons is what we do. That is why we sell more Wagon Wheels and Wagons than anyone else. Click Image To View Wood Wagon Wheel Information And Larger Image. Dimensions: 12 spokes, 1 1/2" wide with 1 1/4" thick felloes and the hub is 6" long and 4 1/4" diameter, center hole bore is 7/8 inch. Price: $125.95. Click Image To View Wood Wagon Wheel Information And Larger Image. Dimensions: 12 spokes, 1 1/2" wide with 1 1/4" thick felloes and the hub is 6" long and 4 1/4" diameter, center hole bore is 7/8 inch. Price: $139.95. Click Image To View Wood Wagon Wheel Information And Larger Image. Dimensions: 12 spokes, 2" wide with 1 1/4" thick felloes and the hub is 9" long and 6 1/2" diameter, center hole bore is 1 inch, 4 band hub,1/2 steel rims, Price: $269.95. Click Image To View Wood Wagon Wheel Information And Larger Image. Dimensions: 12 spokes, 2" wide with 1 1/4" thick felloes and the hub is 9" long and 6 1/2" diameter, center hole bore is 1 inch, 4 band hub,1/2 steel rims, Price: $279.95. Click Image To View Wood Wagon Wheel Information And Larger Image. Dimensions: 12 spokes, 2" wide with 1 1/4" thick felloes and the hub is 9" long and 6 1/2" diameter, center hole bore is 1 inch, 4 band hub,1/2 steel rims, Price: $294.95. Click Image To View Wood Wagon Wheel Information And Larger Image. Dimensions: 12 spokes, 2" wide with 1 1/4" thick felloes and the hub is 9" long and 6 1/2" diameter, center hole bore is 1 inch, 4 band hub,1/2 steel rims, Price: $309.95. Click Image To View Wood Wagon Wheel Information And Larger Image. Dimensions: 10 Spokes, 1" thick felloes, 1/2 axle hole in hub, hub is 2 1/2" wide, add rubber $20.00, Base Price: $65.95. Click Image To View Wood Wagon Wheel Information And Larger Image. Dimensions:10 Spokes, 1" thick felloes, 1/2 axle hole in hub, hub is 2 1/2" wide, add rubber $20.00, Base Price: $65.95. Click Image To View Wood Wagon Wheel Information And Larger Image. Dimensions:12 spokes, 1 1/4" wide, 1 1/4" thick, solid aluminum hub, 7/8" axle hole in hub, shrunk steel rims, Price: $86.95. Click Image To View Wood Wagon Wheel Information And Larger Image. Dimensions:12 spokes, 1 1/4" wide, 1 1/4" thick, solid aluminum hub, 7/8" axle hole in hub, shrunk steel rims, Price: $92.95. Click Image To View Wood Wagon Wheel Information And Larger Image. Spokes are turned, like all our wheels, the wheel is made of steambent hickory. Dimensions: 8 spokes, 12" diameter, 1" wide by 1" thick felloes steel rims, Price: $84.95. Click Image To View Wood Wagon Wheel Information And Larger Image. Spokes are turned, like all our wheels, the wheel is made of steambent hickory. Dimensions: 8 spokes, 14" diameter, 1" wide by 1" thick felloes steel rims, Price: $86.95. Click Image To View Wood Wagon Wheel Information And Larger Image. Spokes are turned, like all our wheels, the wheel is made of steambent hickory. Dimensions: 8 spokes, 16" diameter, 1" wide by 1" thick felloes steel rims, Price: $89.95.